Bit of a surreal experience this weekend: I caught the Napa, CA stop on Peter Murphy’s “Mr. 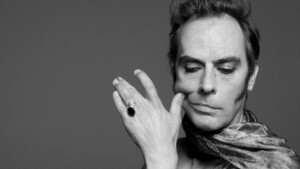 Moonlight” tour, where he is playing Bauhaus songs without the assistance of any other members of Bauhaus. I had strong reservations about this whole concept, but in the end the chance to see Mr. M belting out the classics was just too much to resist. The venue was the charming but somewhat seedy Uptown Theatre, and the crowd was a select group of 65 or so hardy souls, mostly us geezers, but with a handful of younger folks scattered in. But after that shaky start, things settled down, and we were treated to a nice trio of songs from In the Flat Field. These simpler, rawer songs obscured whatever shortcomings the band may have had, while Murphy — though clearly somewhat weary of voice — shrieked and wailed in his own inimitable fashion. For just a moment it was possible to imagine you were in a dark club somewhere in England in 1980, listening to some weird but brilliant band no one had ever heard of. • “Passion of Lovers,” pounded out with gusto by the chubby drummer, who looked as if he were about to have an infarction at any moment. • The inevitable “Bela Lugosi’s dead,” ridiculous and irresistible as ever. The bassist, whatever his name was, did a superb job reproducing David J.’s slinky line while The Prince of Darkness stood in the back with his reading glasses on, coaxing bat sounds from his phone. Very strange. Very 2013. But highly entertaining. The show closed with scorching versions of “Stigmata Martyr” and “Dark Entries,” followed by a song I didn’t know which I am led to believe was a Dead Can Dance cover. Then Peter’s personal assistant appeared to inform us that he was sorry but there would be no encores. This irritated me only slightly until I looked online and saw that other, similar shows had been followed by a five-song encore of “Hollow Hills,” “Spirit,” “She’s in Parties,” “Telegram Sam,” and “Ziggy Stardust.” That would have brought the roof down — though to be fair it was a fragile-looking roof — or at least caved in part of my skull, but it was not to be. Well, on the whole, I can’t complain. Peter could just as easily be in prison now — he had a recent issue with the law in Southern California, which I won’t get into here; if you want you can find all the deets online, including a sad-looking mugshot. Instead I got to hear some songs I love and have a delightful weekend in Napa. Someday I’ll get my encores…maybe at the Bauhaus reunion in Hell. This entry was posted	on Monday, October 14th, 2013 at 5:50 pm	and is filed under Dancing about architecture. You can follow any responses to this entry through the RSS 2.0 feed. You can leave a response, or trackback from your own site. Never heard of any of this, but I’m glad you enjoyed it.